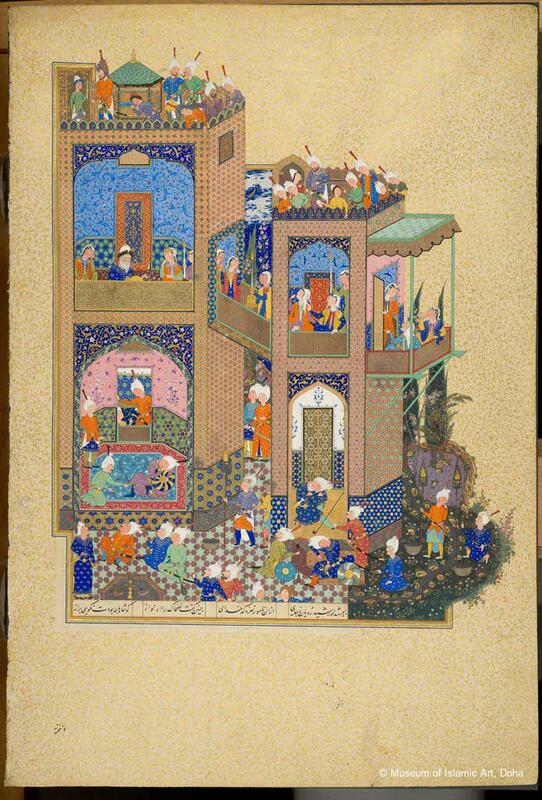 This illustration is from the famous Shahnama of Shah Tahmasp I (r.1524-1576 AD). 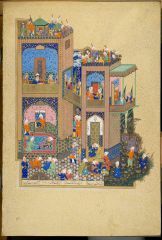 The particular scene shows an episode in the life of the evil king Zahhak. After making a deal with the devil to usurp the throne from his father, Zahhak was cursed with two serpents that grew from his shoulders and fed on human brains. In the scene, a distressed perspective of the architecture reflects his frightened state of mind. Chekhab-Abudaya, Mounia and Tugwell, Julia, Imperial Threads: Motifs and Artisans from Turkey, Iran and India, Milan: Silvana Editoriale, 2017. Soueif, Ahdaf, Reflections on Islamic Art, Doha: Bloomsbury Qatar Foundation Publishing, 2011. Watson, Oliver, Museum of Islamic Art, Doha, Qatar, Munich: Prestel Verlag, 2008.